For years I have been using baby oil to remove make-up on my face! Initially I was scared to put actual oil on my face (especially since in high school I was told oil was the cause of all breakouts so only purchased oil free products for many many years). My best friend turned me onto this miracle product (sometime in college) and I have been in love ever since. My face has never felt softer and the oil removes any pesky make-up! I am also approaching the big 3-0 an don't have any wrinkles in sight (wish I could say the same about grey hair) and have super soft skin! The other great (arguably best) part of this product is that it's very inexpensive and lasts a long time (I have to refill cotton balls before I refill the oil)! 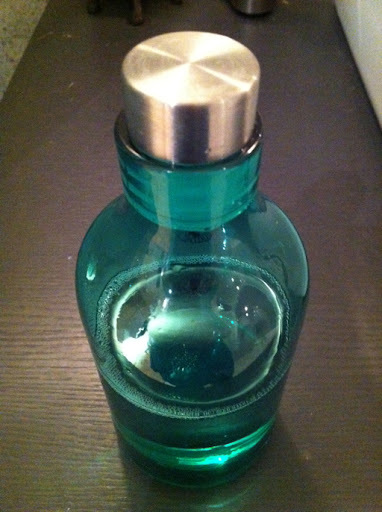 I recently purchased this pretty green glass bottle to house said oil; doesn't it look pretty!